The Skilled Migrant Category changes, implemented on 28 August 2017, are designed to ensure we are attracting migrants who bring the most economic benefits to New Zealand and to improve the skill composition of people gaining residence under the Skilled Migrant Category. This changes the way that ‘skilled employment’ and ‘work experience’ are assessed and awarded points. Points for employment, work experience and qualifications in identified future growth areas, as well as points for qualifications in areas of absolute skills shortage and points for close family in New Zealand are also removed. The changes actually put more focus on skilled work experience, more recognition of skill levels in the 30-39 age group and high remuneration levels. Jobs at ANZSCO skill levels 1, 2 and 3 must be paid at or above $23.49 per hour, or $48,859 per year based on a 40 hour week. Jobs that are not ANZSCO skill level 1, 2 or 3 must be paid at or above $35.24 per hour, or $73,299 per year based on a 40 hour week. Bonus points for high remuneration at or above $46.98 per hour, or $97,718 per year based on a 40 hour week. Additional points available for work experience (but only for skilled work experience). 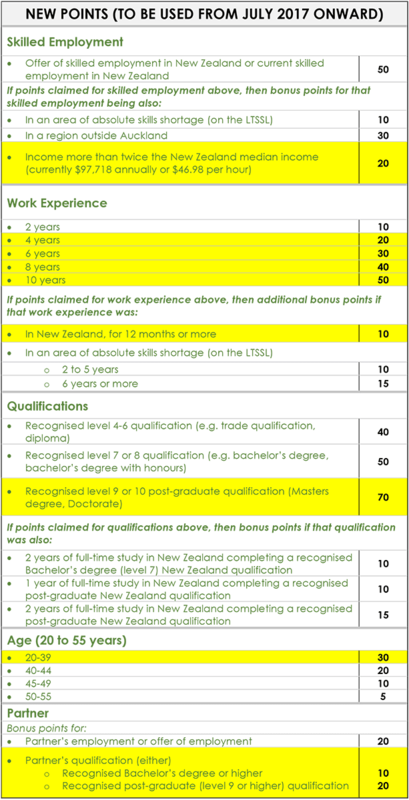 Ten bonus points awarded for skilled New Zealand work experience of 12 months or more, but no additional points for work experience of two years or more. Points for recognised level 9 or 10 post-graduate qualifications (Master’s degrees and Doctorates) will increase to 70 points. Points for people aged 30 – 39 years will increase to 30 points. Points will only be awarded for partners’ qualifications if the qualifications are either a Bachelor’s level degree or higher, or a post-graduate (level 9 or 10) qualification. Points will no longer be available for: employment, work experience and qualifications in identified future growth areas; points for qualifications in areas of absolute skills shortage or points for close family in New Zealand. All applicants who meet the health, character, English and selection point requirements, but do not have either skilled employment or a higher degree gained in New Zealand will be invited to apply for a ‘job search visa’ to enable them to find ongoing skilled employment in New Zealand. There will be greater flexibility for offshore applicants to travel to New Zealand within the 12 month validity of their ‘job search visa’.